Looking for Swimming Pool Experts? Are you looking for supplies for your pool? Are you a distributor of Pool Equipment? With a team of highly trained swimming pool engineers, we can assist you with all breakdowns, servicing and installation needs. We offer industry chemical dosing equipment, advice, installation, chemicals, trouble shooting, maintenance, servicing, spares and training. We are; independent, innovative, experienced, cost effective and reliable. We operate throughout the UK and have a proven track record of customer service and care. JAK Water was founded in 2003, with broadening horizons and the birth of the FlowTab (calcium hypochlorite dosing system) JAK was destined to evolve and extend its business portfolio. Today JAK has the ability to offer a complete package of services from plant installation, maintenance, chemical supplies, training and consultancy. We offer online purchasing through our website and strive to make our products and services more accessible to our Customers. JAK have over 30 years broad and in depth experience of all water treatment solutions. We are always looking for new ideas and products, keeping abreast of the latest technologies and methodologies. We endeavour to offer the best products and services at the best prices ensuring quality, customer service and dependability. Our swimming pool engineers are trained to an exceptionally high standard, offering you installation works, servicing and breakdown cover. JAK work closely with our business partners in Europe, ensuring an international presence and influence is supported both in the UK and worldwide. JAK Water Systems have designed, developed and manufactured the FlowTab II. With a proven track record and suitable for both municipal and potable applications it has been successfully distributed world wide as a leader in calcium hypochlorite feeder systems. JAK Water System are the approved solution partners for Evoqua Water Technologies. Our swimming pool engineers can assist you with all Evoqua dosing systems. For the domestic pool and spas, look no further than Pool Power. Providing a complete range chemicals with ease of use in mind. It is crucial that you use the correct dosage of chemicals in your swimming pool. 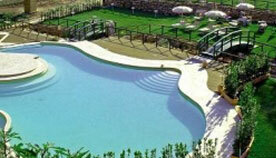 Therefore, it is essential that you know the correct volume of water in your swimming pool. To help you work this out we have developed an online calculator to help you calculate the actual volume of water in your pool, based on its dimensions. We have a range of publications and brochures to provide you with all the information you need to keep your pool in its best condition.